This applet will show 5(with temperature text) to 10(in total) black curves of black body radiation curve between Tmin and Tmax. http://www.phy.ntnu.edu.tw/ntnujava/index.php?topic=427.msg3833#new for original Å (angstrom) version by Fu-Kwun Hwang. What is a blackbody radiation? A black body is an idealized physical body that absorbs all electromagnetic radiation falling on it. Because of its perfect absorptivity at all wavelengths, a black body is also the best possible emitter of thermal radiation, which it radiates incandescently in a characteristic, continuous spectrum that depends on the body's temperature. At Earth-ambient, low temperatures this emission is in the infrared region of the electromagnetic spectrum and not visible, and therefore the object appears black, since it does not reflect or emit any visible light. 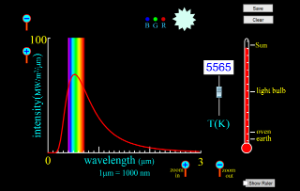 t is called blackbody radiation and has a distribution with a frequency maximum that shifts to higher energies with increasing temperature. As the temperature increases past a few hundred degrees Celsius, black bodies start to emit visible wavelengths, appearing red, orange, yellow, white, and blue with increasing temperature. By the time an object is visually white, it is emitting a substantial fraction as ultraviolet light. 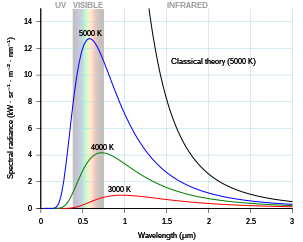 As the temperature decreases, the peak of the blackbody radiation curve moves to lower intensities and longer wavelengths. The blackbody radiation graph is also compared with the classical model of Rayleigh and Jeans. The concept of the black body is an idealization, as perfect black bodies do not exist in nature. Graphite is a good approximation, however. Experimentally, blackbody radiation may be established best as the steady state equilibrium radiation in a rigid-walled cavity. A closed box of graphite walls at a constant temperature with a small hole on one side produces a good approximation to ideal blackbody radiation emanating from the opening. sort of completed customization to nano metre. hopefully others will enjoy using this for learning especially A level Physics for a Data Analysis Problem that i encountered before. This applet will show six black curves of black body radiation curve between Tmin and Tmax. You can use it for study the intensity for black body radiation. The wavelength unit in the simulation is nm (nanometre). Source Code for the Ejs Open source java applet Blackbody radiation curves customised for nm program. There is even a citation quote"
Fantastic! but the auto-generated names is not so correct. It is ready at OSP comPADRE collection . Followed the html description as advised by Prof Wolfgang. The version uploaded above now the same as the OSP version. The Blackbody Radiation Spectrum model shows six fixed-temperature curves between Tmin and Tmax and a red variable-temperature curve that can be adjusted using a slider. The wavelength is measured in nm (nanometer) and the intensity is measured in W.e-5 / (m2.nm). Users can adjust Tmin and Tmax to change the temperature range that is displayed. The Blackbody Radiation Spectrum model was created by created by Fu-Kwun Hwang, customized by Loo Kang WEE, and edited by Wolfgang Christian using the Easy Java Simulations (EJS) version 4.2 authoring and modeling tool. An applet version of this model is available on the NTNU website < http://www.phy.ntnu.edu.tw/ntnujava/ >. There is other similar applets that i encountered. http://webphysics.davidson.edu/alumni/MiLee/java/bb_mjl.htm by Mike Lee & Wolfgang Christian.